83 “What do you have to lose?" Barbara Jean Lee is a pro-socialist Democratic member of the United States House of Representatives, representing the 13th district of California. Born 1946, in El Paso, Texas, Barbara Lee her spent teenage years in San Fernando, CA. Mills College, B.A., 1973; University of California at Berkeley, M.A. social work degree, 1975. Lee's radicalism dates at least to the early 1970s when she was a confidential aide to Black Panther Party "Minister of Defense" Huey Newton. Lee was inspired to a political career while a campaign worker for Shirley Chisholm's 1972 presidential campaign. Chisholm was the first black woman to enter Congress. Chisholm had a long history of Communist Party USA front affiliation, but entered Congress through the Democratic Party in New York's 11th district. Both Dellums and Lee were encouraged to enter politics by longtime Berkeley Councilwoman and Communist Party USA supporter, Maudelle Shirek. Another key influence on Lee was Bay Area doctor and publisher Carlton Goodlett, also a long time Communist Party supporter. Still another was Bay Area radical and Committees of Correspondence member Yvonne Scarlett-Golden. “Yvonne Scarlett-Golden was a friend to me and an inspiration to many. As the first African-American Mayor of Daytona Beach, she knew about breaking down barriers, and the fact that she came to politics after a full career as a teacher and school administrator is a testament to her determination to serve. Lee was "schooled by the likes of Ron Dellums, former Oakland mayor Lionel J. Wilson, Willie Brown, John George, Gus Newport, Maudelle Shirek, Hazaiah Williams and Bishop Will Herzfeld..."
Lee is the most senior Democratic woman on the House International Relations Committee. Standing on principle amid post-9/11 hysteria, she was the only member of Congress to vote against the resolution broadly authorizing President Bush’s use of force. Barbara Lee was an Executive Board member of the Communist Party USA dominated U.S. Peace Council 1983-1985-Oakland California. Ms. Lee told The Progressive magazine that her life was influenced by the late Carlton Goodlett, a dedicated Stalinist and served in the leadership of the international Soviet front, the World Peace Council. He used a newspaper he owned to spread Soviet disinformation and to promote KGB forgeries. In 1981, Ms. Lee wrote to the World Peace Council asking that the Soviet front pay for air tickets for California Rep. Ron Dellums and two staffers to attend one of their conferences. Lee provided counterintelligence support to the Marxist-Leninist regime in Grenada in 1980, tipping off the Cuban-backed government to a possible anti-communist spy in the office of premier Maurice Bishop. In 1982, together with her colleague Carlottia Scott, she accompanied her boss, Mr. Dellums, to communist-ruled Grenada. They wrote a report to the House Armed Services Committee in support of the airport being built on the island, which the U.S. government believed could be used by Soviet bombers aimed at us. Mr. Dellums, Ms. Lee and Miss Scott provided their draft report to Maurice Bishop, the communist dictator on the island to vet before they sent the final copy to the U.S. House of Representatives. Ms. Lee was Mr. Dellums' administrative assistant. When she left the job to run for the California legislature in 1987, Miss Scott took over the job. When Mr. Dellums left Congress in April 1998, Ms. Lee won the seat and Miss Scott became her administrative assistant. Miss. Scott was enamored both with Maurice Bishop and communist Grenada. In a handwritten letter to Mr. Bishop addressed to "My Comrade Leader" Miss Scott wrote: "Grenada is my home and where my deepest love will always remain. I am sincerely committed and dedicated to Grenada. I feel that now, I will be able to convey in a more comprehensive manner, the thoughts and directions of the PRG [People's Revolutionary Government of Grenada] which, based on a solid foundation, will, in eccence [sic] help to keep the REVO [revolution] up in North America." Lee opposed the US-led ouster of Grenadian General Hudson Austin, who had murdered Maurice Bishop, his former ally, in a coup just days before. Lee and Scott wrote the report in collaboration with the regime - and sent it back to Bishop for his editing and approval before making the document public as a congressional report. Scott was rumored to have been romantically involved with Bishop. Her personal letters, captured in Bishop's office after the US liberation, included one that begins, "My darling comrade leader." In a typewritten letter to Bishop on US House of Representatives letterhead, dated April 28, 1982, Scott describes how she and Lee involved Dellums in promoting the Grenadan regime. 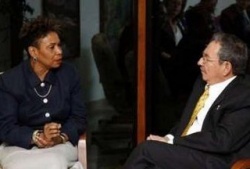 Scott described what she, Dellums and Lee were doing to run influence operations in Congress on behalf of the Cuban-backed government: "We are now in the process of pulling together the report for the Armed Services Committee, preparing testimony for the Inter-American Affairs Committee Hearings on Grenada, and in the process of trying to come up with a strategy to bring the U.S. and Grenada to the negotiating table." A mixed group of Communist Party USA members and supporters, assorted communists/marxists, and other far-left individuals held a "Founding Conference" of the U.S.- Grenada Friendship Society in Washington, D.C. on April 26, 1980. Barbara Lee was one of the conference sponsors. Barbara Lee - Chair of the California Rainbow Coalition. In 1991/92, the Communist Party USA split, with many members leaving to form a new Marxist-Lenist organization, the Committees of Correspondence (CoC). At the Committees of Correspondence founding conference, Berkeley California, July 17-19, 1992, Barbara Lee was a candidatefor the CoC National Coordinating Committee, while a Democratic California State Assembly person. On August 2 2017, Marc H. Morial and Barbara Lee hosted a "Community Forum" in Oakland, California called "What Do You Have To Lose? The Impacts of Trump on African Americans." "On Wednesday, August 2, 2017, I hope you will join me for a timely discussion on the Trump Administration’s policies and their impact on the African American community, both nationally and here in the East Bay. "President Trump & his Administration are actively undermining progress for the African Americans by elevating white nationalists, crippling civil rights protections and eroding lifelines for families, including health care, child care and nutrition assistance. "Please join me and Marc H. Morial, former Mayor of New Orleans and President of the National Urban League, for an important conversation on our community’s resistance & resilience." In the March 21, 1998 edition of the People's Weekly World , page 16, "Lincoln vets honor Robeson", "Greetings to the crowd of more than 1,000 were presented by State Senator Barbara Lee, who is a candidate for Congress to succeed the retiring Ron Dellums. Lee condemned the current blockade against Cuba as 'wrong' and called for its removal, to be replaced by a 'normalizing' of relations with Cuba." "The Cuban people," said Lee, "should be allowed to determine their own course of action in accordance with self-determination." Lee also attacked California Gov. Pete Wilson for his opposition to affirmative action and for his denial of prenatal medical care to thousands of California's non-citizen immigrants." 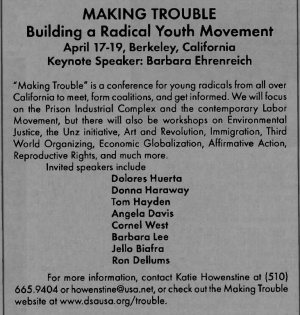 Making Trouble- Building a Radical Youth Movement' was held April 17-19, 1998 Berkeley, California. San Francisco Bay Area Democratic Socialists of America supportedBarbara Lee's sole dissenting vote in Congress after the 9/11 attacks. The DSA national convention passed a resolution condemning the September 11 attacks, supporting in principle the selective use of multilateral armed force, and calling for a halt to the bombing. Its text, along with previous statements by DSA on the war, will presumably be available at the national web site soon. The Sacramento local and the anti-racism commission issued a prior statement, also available as an MS Word document. The East Bay local will be working for the re-election of Barbara Lee, the sole member of Congress to oppose a resolution granting sweeping, vaguely specified war powers to our illegitimate President. One time Democratic Socialists of America member Nancy Skinner was a Field Manager for Barbara Lee's 2002 Congressional campaign. 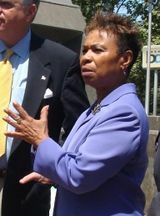 Barbara Lee was on the list of 153 speakers at the 2006 Take Back America conference, which was organized by the Institute for Policy Studies, and Democratic Socialists of America dominated Campaign for America's Future. Congressional endorsers of the proposal included Barbara Lee. May 1, 2015, Representatives Jared Polis (D-CO), Steve Cohen (D-TN), and Earl Blumenauer (D-OR) sent a letter to President Obama urging him to nominate a new Drug Enforcement Administration chief that has a more progressive approach to federal drug enforcement. Barbara Lee (D-CA), Sam Farr (D-CA), Zoe Lofgren (D-CA), and Eric Swalwell (D-CA) also joined in sending the letter. The Representatives urged the President to nominate a DEA Administrator who is willing to work with state and federal officials to create policies that work with­—not against­­—the evolving landscape of state marijuana laws. The letter states that retiring DEA director Michele Leonhart placed too great an emphasis on prosecuting marijuana use and not enough on drug-related activity that truly poses a public-safety risk. “The DEA plays a critical role in promoting the health and safety of Americans. But to succeed in its mission, it must refocus its efforts on cracking down on bad actors who seek to evade state laws rather than those who abide by them,” the Representatives wrote. “All of us share a commitment to keeping drugs out of the hands of children, diminishing the reach of criminal cartels, and helping individuals who are addicted to drugs find the help they need to turn their lives around. “To accomplish these aims, the DEA must end its resistance to the changing public consensus on marijuana use and stop expending its limited resources to prosecute individuals who are not a threat to public safety and, instead, focus on drug activity that poses a more serious risk,” they added. An event "Celebrating the Legacy of Dr. Martin Luther King Jr" was held on April 4, 2004, at the infamously leftist Riverside Church in New York City. "WHEN YOU STAND UP FOR PEACE AND JUSTICE... YOU STAND WITH THE PEOPLE!" "Welcome Congresswoman Barbara Lee the first Congressional vote vs. Bush's war"
Barbara Lee, was on three Cuba trips in 2014, and has been more than 20 times since the 1970s. In 1977, Barbara Lee and Ron Dellums were part of a delegation to Cuba, which met with Fidel Castro to discuss health problems. Saturday May 8, 1999, "Cuba Town Hall Meeting" Congresswoman Barbara Lee to Sponsor Berkeley, CA at 1 pm to 3:00 pm at La Peña Cultural Center in Berkeley, CA. On February 18 1990, six members of the U.S. Congressional Black Caucus visited Cuba to evaluate the U.S.-imposed embargo. Among the visitors: Maxine Waters and Barbara Lee of California, Sheila Jackson-Lee of Texas, Julia Carson of Indiana and Gregory Meeks from New York and Earl Hilliard of Alabama [Vice Chair, CBC]. In May 2004, Julie Nickson from the office of Congresswoman Barbara Lee spent four days in Havana, Cuba, for the purpose of "fact finding". The trip cost $1,393.16 and was paid for by the Christopher Reynolds Foundation. Reps. Emanuel Cleaver (D-MO), Marcia L. Fudge (D-OH), Laura Richardson (D-CA), Bobby Rush (D-IL), Melvin Luther Watt (D-CA), and Barbara Lee. "Also participating were Patrice Willougby, executive assistant to the Congressional Black Caucus, and Eulada Watt, wife of Congressman Mel Watt,". Teresa Glover, a 27-year-old medical student, told me during a recent visit to her medical school. "Nobody in my family has ever had the chance to be a doctor." Glover's mother is a teacher, and her father a dispatcher for the New York subway system. Her background is a mix of African American, Barbadian, and Cherokee. She graduated from the State University of New York at Plattsburgh. "I wanted to be a doctor, but I wasn't sure how to get into medicine. I had decent grades, but I didn't have any money, and even applying to medical school cost a lot." In her third year, Glover is negotiating the classic passage from the laboratory to the clinic. . She is enrolled at the Latin American School of Medicine (ELAM, which is its Spanish acronym) in Havana - a school sponsored by the Cuban government and dedicated to training doctors to treat the poor of the Western hemisphere and Africa. Twenty-seven countries and 60 ethnic groups are represented among ELAM's 8000 students. In 2004, there were 88 U.S. students at ELAM, 85 percent of them members of minority groups and 73 percent of them women. Recruitment and screening are handled by the Interreligous Foundation for Community Organization , a New York-based interfaith organization. The Bush administration's restrictions on travel to Cuba have been a thorn in the side of the program from the beginning. Since the Cuban government pays the students' room, board, tuition, and a stipend, the ban was not initially applied to them. But the administration's further attempts to curtail Cuban travel threatened the students and sent their families scrambling for political help. Representatives Barbara Lee (D-Calif.) and Charles Rangel (D-N.Y.) led a campaign of protest, and 27 members of Congress signed a letter to Secretary of State Colin Powell asking that the ELAM students be exempted from the ban. In August, the administration relented and granted the students permission to remain in Cuba. Signatories included Rep. Lee . On June 18, Lee, Eshoo, and DeLauro also met with former Communist Party USA journalist Portia Siegelbaum, now living in Cuba, married to a Cuban. In January 2018, Center for Democracy in the America led a bipartisan delegation of U.S. House Members to Havana to meet with Cuban officials investigating the mysterious symptoms experienced by U.S. diplomats, assess the impact of recent U.S. policies on the Cuban people, and explore areas for future collaboration. The trip included Representatives Barbara Lee (CA-13), Karen Bass (CA-37), and Roger Marshall (KS-01). The delegation had the opportunity to speak briefly with Cuban President Raul Castro and met First Vice President Miguel Diaz-Canel. The decentralized system would provide high quality comprehensive care for all, regardless of one’s ability to pay. Lee’s bill would make high-quality preventive, acute and long term care available to everyone regardless of demographics, employment status, or previous health status. Over forty million individuals in America have no health insurance. Despite numerous debates and discussions, Congress has failed to provide a viable solution to this national crisis. Access to health care directly impacts the welfare of individuals in many poor and minority communities. Of the uninsured, 56% are low income, and although minorities make up approximately 34% of the population, they comprise over half of the nation’s uninsured. In 2003 Rep. Barbara Lee served on the Progressive Majority Advisory Committee. In 2006, Barbara Lee was one of many prominent Northern California leftists to serve on State Assembly hopeful Sandre Swanson's Honorary Campaign Committee. Elected officials attending the 1997 Bay Area People's Weekly World banquet, at His Lordships, Berkeley Marina, included State Senator Barbara Lee Assemblywoman Liz Figueroa, Alemeda County Board of Supervisors president Keith Carson and Berkeley vice mayor and City Council member Maudelle Shirek. Keynote speaker Eliseo Medina, Service Employees Union International executive vice president, received a standing ovation at the People’s Weekly World banquet in Berkeley Nov. 18 2001, when he sharply criticized Republicans for killing an economic stimulus program that would have benefited working families. In addition to Medina, the banquet honored the East Bay Alliance for a Sustainable Economy (EBASE), the Middle East Children’s Alliance, and Sacramento Activists for Democratic Trade. The event raised $11,000 for the 2001 Fund Drive. Honorees received certificates of Congressional recognition by the office of Rep. Barbara Lee (D-Calif.), in whose district the event took place. Lee’s greeting was presented by her aide, Saundra Andrews. Youth groups and unions on the front line for youth and workers’ rights were honored at the 2003 Northern California People’s Weekly World/Nuestro Mundo banquet on Sunday, Nov. 9. Following the International Longshore and Warehouse Union’s victorious contract struggle in 2002, Longshore Local 10 President Henry Graham said the local and its brother locals are now focused on ensuring the giant shipping transnationals comply with the pact. The contract secured vital health and pension coverage, Graham said, but the union’s biggest challenge is employers’ constant efforts to cut the workforce, with clerks’ jobs under special pressure because of new technology. Based on a survey last year of 1,000 students at three Oakland high schools, student organizers from Kids First "are pressing for real student council powers concerning school safety and security, teacher quality, classes and extracurricular activities". “We also believe helping youth take more ownership of issues affecting their daily lives is an important step to help lower the dropout rate,” Kids First Membership Coordinator Germaine Ashley told the PWW. Kids First formed eight years ago in the midst of the struggle to win more services for Oakland’s multiracial youth population. Asian Youth Promoting Advocacy and Leadership "is campaigning for repeal of a 1996 federal law that says non-citizens can be deported for an offense with a prison sentence of a year or more'. AYPAL said this breaks up families, punishes people twice, and sends people who grew up in the U.S. to a culture they may no longer know. AYPAL, which comprises six youth social justice organizations in the Cambodian, Chinese, Vietnamese, Laotian and Mien, Korean, Filipino and Pacific Islander communities, also works with prominent area artists to develop quality youth cultural performances. Youth of Oakland United, the youth organization of PUEBLO (People United for a Better Oakland) was 'campaigning to win more jobs for both youth and adults". YOU’s video, “There Goes the ‘Hood,’” dramatized Mayor Jerry Brown’s plans to gentrify Oakland, while YOU organized against two of his favorite recent projects – a proposed anti-loitering law ostensibly against drugs, but actually targeting youth of color, and a $70 million anti-violence measure with most funds going to police instead of preventive programs. Each honoree received a special congressional certificate from Democratic Rep. Barbara Lee, in whose district the banquet was held. Berkeley Vice Mayor Maudelle Shirek extended a welcome to all the honorees and guests. 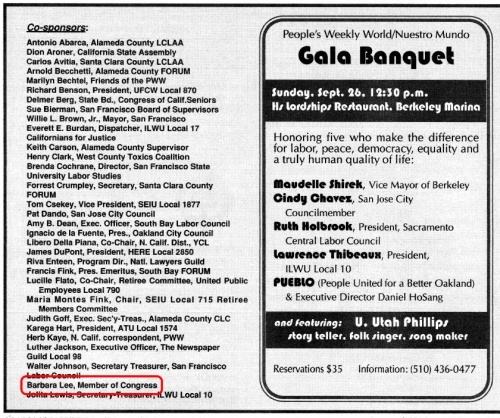 Barbara Lee was involvedin a function organized for the Communist Party USA paper Peoples Weekly World, in Oakland California December 3 2006-as was Communist Party member Jacqueline Cabasso. Every district should consider where we can make a qualitative difference. What are the election campaigns where there is a labor or people's candidate, where we can participate in coalition to build a movement in that election district, and in the process build our Party. Speaking to a crowd of 200 peace activists March 11, 2002, in Oakland California, Reps. Barbara Lee (D-Calif.) and Dennis Kucinich (D-Ohio) took the occasion to condemn the Bush administration’s plans to target seven nations with nuclear weapons. Frank Chapman is a long time Communist Party USA supporter. In the early 1980s he chaired a party front National Alliance Against Racist and Political Oppression. In the mid '80s he served on the board of another communist front, the U.S. Peace Council, alongside two future Barack Obama colleagues and supporters Alice Palmer and Representative Lee. While most California Democrats initially supported Hillary Clinton, in December 2008, California Congresswoman Barbara Lee, became the first California Democrat to endorse Barack Obama. I wanted to share some exciting news with you, as today I announced my endorsement of Senator Barack Obama for President of the United States. Like so many Americans, I first heard Senator Obama when he delivered his electrifying speech at the 2004 Democratic National Convention in Boston. Deep down, I knew I'd witnessed history in the making. Barack Obama represents a bridge to the future. He embodies the hope and new direction that our country so desperately needs. As I've watched Senator Obama campaign for the presidency, I am convinced that he is a real agent of change; a man who can lead our nation in a new and positive direction. This century cries for social, environmental, diplomatic, global, and neighborhood solutions to the misery that confronts far too many people in our own country and around the globe. I share Senator Obama's vision and active commitment to building a society based on activism, progressive values and a keen sense that we must act now and outside of the usual bounds of partisanship and expediency. I know that a President Obama would find a prompt and effective way to end the occupation of Iraq and that he would strengthen U.S. diplomacy and international development as an instrument of national policy to prevent crises that lead to war and conflagration. I know that a President Obama would place education, health care, poverty, economic security, criminal justice reform, climate change and all of the important domestic issues at the top of his agenda. And, I know that a President Obama would make the eradication of HIV/AIDS at home and abroad a top priority. I founded One Voice PAC as an organization dedicated to helping elect truly progressive candidates who will challenge the status quo. To that end, I am honored to endorse Senator Obama's candidacy and I hope you will join me in helping him secure the Democratic nomination for the presidency. Signatories included Rep. Barbara Lee. Barack Obama’s campaign in California formed a “truth squad,” announced via conference call, in January 2008, to counter the attacks that Hillary Clinton’s campaign has leveled in recent weeks. On the call were squad members Bay Area Congressman George Miller, LA Congresswoman Linda Sanchez, Oakland Congresswoman Barbara Lee, and LA County Labor Federation chief Maria Elena Durazo, now a national co-chair of the Obama campaign. Also on the squad are Silicon Valley Congresswoman Zoe Lofgren, LA Congressman Adam Schiff, state Senate Majority Leader Gloria Romero, Assembly Majority Leader Karen Bass, and, San Francisco District Attorney Kamala Harris. 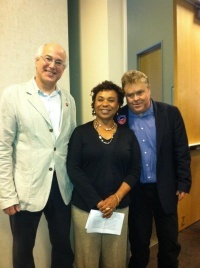 With Malcolm Burnstein and Congresswoman Barbara Lee. Barbara Lee serves on the Advisory Board of Progressive Democrats of America. In 2012, Barbara Lee (CA), was one of 14 leftist Congressional and Senate candidates endorsed by Progressive Democrats of America, an organization dominated by members or affiliates of Democratic Socialists of America and the Institute for Policy Studies. In 2013 Progressive Democrats of America assigned activists to deliver their material to almost every US Congressman and Senator, Michael Eisencher was assigned as the contact for Rep. Lee. In 2018 Progressive Democrats of America endorsed Rep. Barbara Lee, CA-13. As of February 20 2009 Barbara Lee was listed as a member of the Congressional Progressive Caucus. Lee is a former co-chair of the organization. In May 2013, Barbara Lee was listed as a member the Executive Board of the Congressional Asian Pacific American Caucus. An early and outspoken opponent of the Iraq War, the congresswoman repeatedly proposed legislation seeking early U.S. troop withdrawal. In 2007, she successfully blocked funds from being used to establish permanent military bases in Iraq. Her 2008 amendment requiring that any U.S. agreement to defend Iraq be expressly authorized by Congress or be included in a Senate approved treaty was stripped from a defense bill under the threat of a veto by President Bush. On Dec. 22, 2009, thirty-three U.S. Representatives wrote to Secretary of State Hillary Clinton, calling on her to request that the Israeli Government end the ban on student travel from Gaza to the West Bank. Barbara Lee was one of the signatories of the letter. The entire letter together with a complete list of signatories can be read by clicking here. On Jan. 27, 2010, U.S. Representatives Keith Ellison and Jim McDermott led 52 other members of Congress in signing a letter addressed to President Barack Obama, calling for him to use diplomatic pressure to resolve the blockade affecting Gaza. Barbara Lee was one of the signatories of the letter. The entire letter together with a complete list of signatories can be read by clicking here. 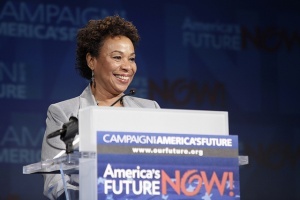 Barbara Lee was one of the 148 speakers who addressed the 2010 America's Future Now Conference. The Conference was hosted by the Institute for Policy Studies, and Democratic Socialists of America dominated Campaign for America's Future, and held from June 7 - 9 at the Omni Shoreham Hotel, 2500 Calvert Street, Washington D.C.
Barbara Lee is on the list of Congressional Representatives who have participated in hearings/briefings since 1998, with the very radical Institute for Food and Development Policy/Food First, founded by Frances Moore Lappe (Democratic Socialists of America, Institute for Policy Studies) and Joseph Collins (Institute for Policy Studies), authors of the book "Food First". 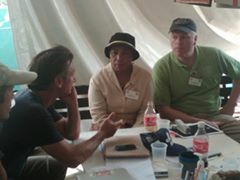 In March 2010 Nicole Lee from TransAfrica Forum, actors Danny Glover and Sean Penn and Reps Barbara Lee and Joseph Crowley were in Haiti working on earthquake recovery efforts. Rep. Lee sent Robert Fuentes, to Honduras and El Salvador for 3 days in May/June 2010. The trip was courtesy of a $4,107.39 grant from the Institute for Policy Studies connected Center for Democracy in the Americas... "Assess the situation in Honduras and El Salvador and current U.S. policy implications in the countries" . "It is a sad time. ... There is no magic formula," Pelosi said. "But we know there are things we can do differently." She called on both parties and the dozen members of the recently appointed bipartisan congressional deficit "Super Committee" to work together to solve the jobs problem. "We are a civilized nation, we are not the law of the jungle," she told the often-vocal group gathered in the church's cavernous hall. "We are a civilized community. ... We have to take this to a higher ground." The event, headlined "Speak Out for Good Jobs Now," aimed to take testimony from Americans on their concerns regarding the economy from an audience overwhelmingly made up of African Americans and labor union loyalists - the heart of the party base and among those hit hardest by the recession. Lee is one of the top recipients of SEIU PAC funds, according to OpenSecrets, having received $59,999 in total from the Political Action Committee. The Council for a Livable World, founded in 1962 by long-time socialist activist and alleged Soviet agent, Leo Szilard, is a non-profit advocacy organization that seeks to "reduce the danger of nuclear weapons and increase national security", primarily through supporting progressive, congressional candidates who support their policies. The Council supported Barbara Lee in her successful House of Representatives run as candidate for California. 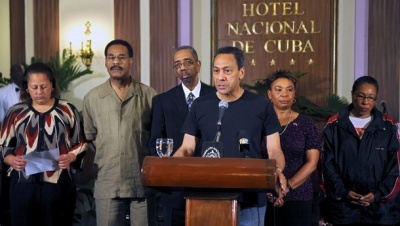 In 2012, the Haiti Advocacy Working Group, Haitian social movements and Haitian Diaspora groups were working with the U.S. Congressional allies, including members of the Congressional Black Caucus, to raise attention to the current status of Haiti’s reconstruction process at the 2 year commemoration marker. From January 23-25, 2012, Haitians, HaitianAmericans and other Haitian development experts brought their voices to Capitol Hill. HAWG allies advocated for a just reconstruction and development process in Haiti, one that prioritizes the needs of women, internally displacedpersons, smallholder farmers, the urban poor, immigrants and other vulnerable Haitians, includes the full participation ofHaitian grassroots groups and the Diaspora and holds the US government accountable for delivery of its commitments. Monday, January 23 4-6pm: Gender Based Violence Panel, hosted by Representatives Frederica Wilson and Barbara Lee. Noon-2pm: Rep. Yvette Clarke sponsoring and TransAfrica Forum hosting a viewing of a documentary, ‘Where did the money go?’, and follow-up briefing, on aid accountability, transparency and procurement. 2-4pm: Rep.’s Lee, Wilson, Payne and Clarke co-sponsoring panel on Land and Housing. September 20, 2011, TransAfrica Forum hosted a series of conversations in celebration of the UN International Year for People of African Descent, Capitol Building Room SVC 212-10 Washington, DC. Honorary Hosts Representatives Bobby Rush, Alcee Hastings, Andre Carson, Yvette Clarke, Barbara Lee, Donald Payne and Maxine Waters. in coordination with the Congressional African Staff Association, Senate Black Legislative Staff Association, Congressional Muslim Staff Association, and Congressional Black Associates. Lee received $1000 in lobbying funds from Planned Parenthood in 2008. Lee has been supported by EMILY's List during her campaigning. Members of the Host Committee included Barbara Lee. Alliance for Retired Americans endorsed Barbara Lee in 2012. Signatories included Rep. Barbara Lee..
. She has also been a strong ally of the pro-Israel, pro-peace movement and promoted continued aid to the Palestinian Authority and Israel. Furthermore, Lee introduced a resolution promoting a diplomatic approach toward preventing Iran from becoming a nuclear power. Her extensive travel in Israel and the West Bank informs her passionate advocacy on behalf of a two-state solution. Signers of New York City Mayor Bill de Blasio's May 12, 2015 launched The Progressive Agenda to Combat Income Inequality included US Rep. Barbara Lee. AMY GOODMAN: Congressmember Barbara Lee of the greater Oakland, California, area is here. Your thoughts today? AMY GOODMAN: What’s it going to take? REP. BARBARA LEE: Getting our legislation passed. We have legislation that would end the embargo, and we’ve got to get members of Congress to vote for it. And you know how that is. But we’re going to keep working on that. And we’ll see that day, too. AMY GOODMAN: Do you think Guantánamo will be closed? Rep. Barbara Lee (D-Calif.) (October 2017). Before an assembly, February 2017, that packed the gymnasium of Fruitvale's International Community School, Congresswoman Barbara Lee (D-13) affirmed her commitment to resisting the Trump administration's attempts to repeal the Affordable Care Act. Lee praised recent progressive gains — overturning the Muslim travel ban, the resignation of Michael Flynn, the withdrawal of Andrew Puzder as Labor Secretary — and stressed the critical role of her district in resisting the repeal of the ACA and other policies of the administration. "So goes the East Bay, so goes the state, so goes the country," said Lee. The fight to retain ACA comes with high stakes for the district — according to Ralph Silber, Executive Director of the Alameda Health Consortium, 350,000 East Bay residents are enrolled in the ACA; for 70,000 of those, it's the first time they've had healthcare coverage. "The only way to deal with a bully is to fight back," said Alameda County Supervisor Wilma Chan, who reported that of all 58 counties in the state, Alameda had enrolled the most people onto MediCal. February 1, 2017, United for Peace and Justice has joined with the U.S. Peace Council, Veterans for Peace and several other national peace organizations to initiate a public campaign in support of Congresswoman Tulsi Gabbard’s (D-Hawaii) STOP ARMING TERRORISTS ACT (H.R. 608), which she originally introduced to the Congress on December 8, 2016. Please sign the petition urging support for the Stop Arming Terrorists Act. H.R. 608 is a bipartisan bill, which has been co-sponsored by Rep. Barbara Lee (D-California), Rep. Thomas Massie (R-Kentucky), Rep. Peter Welch (D-Vermont), Rep. Walter B. Jones (R-North Carolina), and Rep. Ted Yoho (R-Florida). We believe that the Stop Arming Terrorists Act is a courageous and important first step toward ending the U.S. Government’s policy of forced regime change in other countries with the help of terrorist organizations. This policy has led to endless wars in the past decades, and has cost trillions of dollars at the expense of American taxpayers. H.R. 608 has been referred to both the House Intelligence Committee and the House Foreign Affairs Committee. Given the present state of politics in our country, the chance of these committees approving the bill seems very slim in the absence of massive public expression of support for it. “What do you have to lose?" Panelists included Marc Morial, president of the National Urban League; state Assemblymember Tony Thurmond and Bay Area Rapid Transit (BART) Director Lateefah Simon. Angela Glover Blackwell of PolicyLink moderated the discussion. “You remember that during the campaign, Donald Trump said to the black community, ‘What do you have to lose?’ Well, we have to look at what we are losing,” Lee said. Picking up on that theme, Morial – a former mayor of New Orleans – highlighted risk areas the Trump administration’s policies pose for African Americans, all people of color, and “all people who love justice in 21st century America.” Citing the Urban League’s annual report, The State of Black America, Morial called attention to profound inequities in health, housing, education and social justice. Voter suppression is the number one risk posed by the Trump administration, said Morial, followed by efforts to strip health care away from millions of people, and the assault on the federal budget. “Our state is spending $5 billion per year to incarcerate people in private prisons, run by people who are profiting from the suffering of our families and our loved ones,” California Assemblymember Tony Thurmond, D-Richmond told the crowd. “We need to get to a place of prevention and re-entry. Let’s educate, not incarcerate.” Thurmond introduced Assembly Bill 43 earlier this year. AB 43 would tax private prisons and spend the resulting revenue on programs shown to prevent incarceration, including universal preschool and after-school programs. Other area elected officials participating included Alameda County Supervisor Keith Carson and Oakland Mayor Libby Schaaf. She the People's three-year initiative kicked off with its inaugural She the People Summit on September 20, 2018 at the Julia Morgan Ballroom in San Francisco. The sold-out, first-ever national summit of women of color in politics drew nearly 600 attendees, mostly women of color, from 36 states. In August 2018 Medicare For All Congressional Caucus founding members included Representative Barbara Lee. Congressional supporters by December 20 2018 included Barbara Lee. By February 20 2019 endorsers of Alexandria Ocasio-Cortez's HR 109 (Green New Deal) included Barbara Lee. Today, after nearly 17 years, the Democratic Party adopted a resolution I submitted calling for the repeal of the 2001 Authorization for Use of Military Force (AUMF). I was proud to have our DNC and progressive leaders sign on as co-sponsors, including my good friend DNC Deputy Chair Congressman Keith Ellison, DNC Vice-Chair Congresswoman Grace Meng, Congresswoman Barbara Lee, Our Revolution Board Chairman Larry Cohen, Chair of Hawaii Democrats Timothy Vandeveer, and nearly 20 other co-sponsors. It is past time for Congress to have a debate and #VoteOnWar. Passed only three days after the attacks of 9/11, the 2001 AUMF has given three administrations expansive and endless war-making powers without consulting Congress. This is an abdication of Congress’ constitutional duties. I am heartened that the Democratic Party recognizes the dangers of using an outdated war authority and is calling on all Democratic members in Congress to support bipartisan efforts to repeal the 2001 AUMF. Barbara Lee, Christine Ahn March 14 2019. This page was last modified on 25 April 2019, at 02:08.